I was lucky enough to acquire an almost unused Major Nichols in its original paint and livery. It is my size and has a complete set of then standard basic parts. Built in the early 80’s, probably 1984, it had been loved and immaculately maintained but latterly was sadly stored away for years in slightly damp conditions which caused significant issues. Overall a very nice but ordinary little frame built by an extraordinary man for an enthusiast. Passed on to a friend, treasured and unknowingly abandoned, recognised by the family. Here she is when last used I suspect, before she needed conservation. Built from a Reynolds 531 ST Frameset with Prugnat or Haden lugs with heart shape cutouts and a Vagner DP + Losenge Fraise fork crown. Black enamel with white lining and fishtail motif on the short panel faired in seatstay tops, 130mm rear D/O. Braze-on Campagnolo DT shifter bosses and BB cable guides. 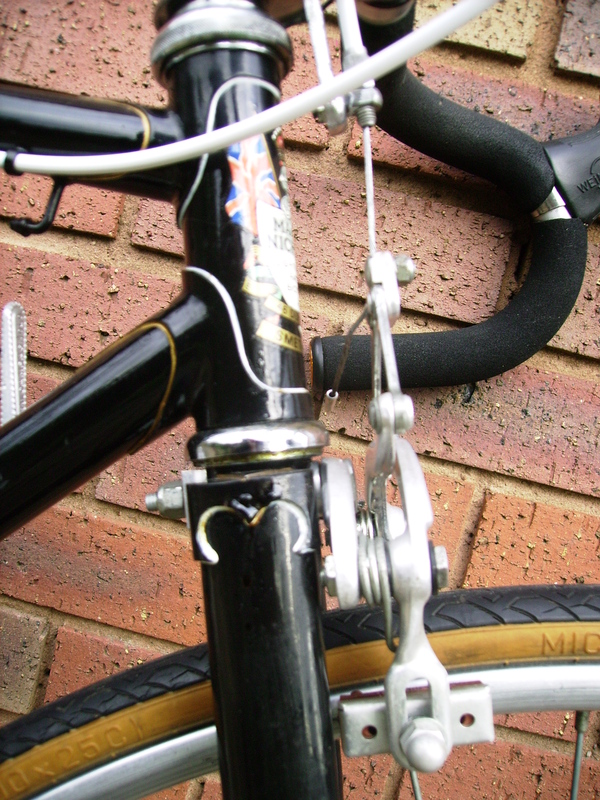 Cable stop and guide on OS chain chainstay and stops and guides for rear brake on TT at 4 o’clock on the off side. 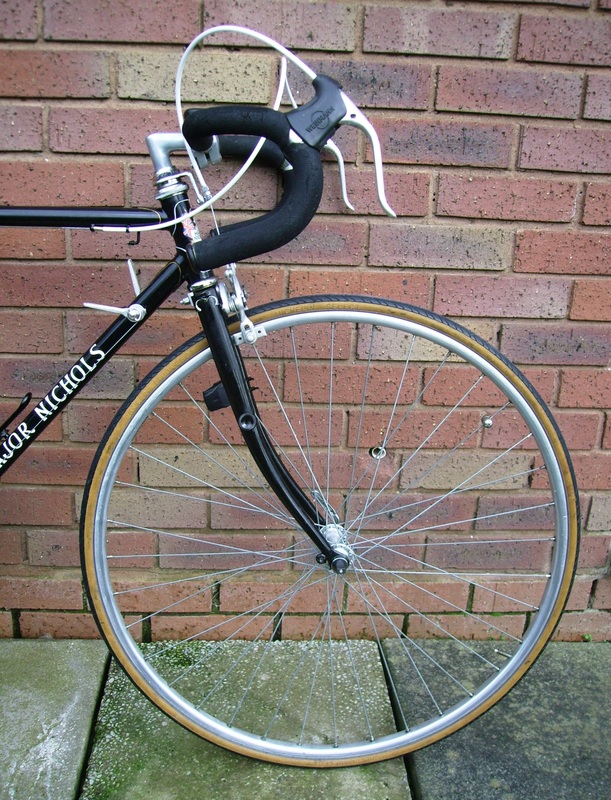 Centrepull brake bridge, straight, reinforced seatstay bridge and straight chainstay bridge. OS fork light bracket boss. 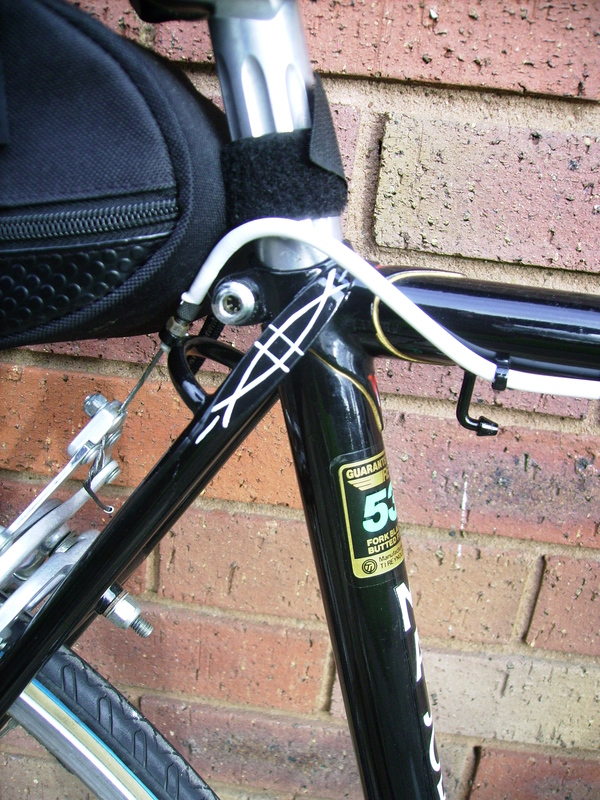 Head and S/T Durban Road transfers and DT and ST Major Nichols in gothic script, Reynolds 531ST transfer on seat post. 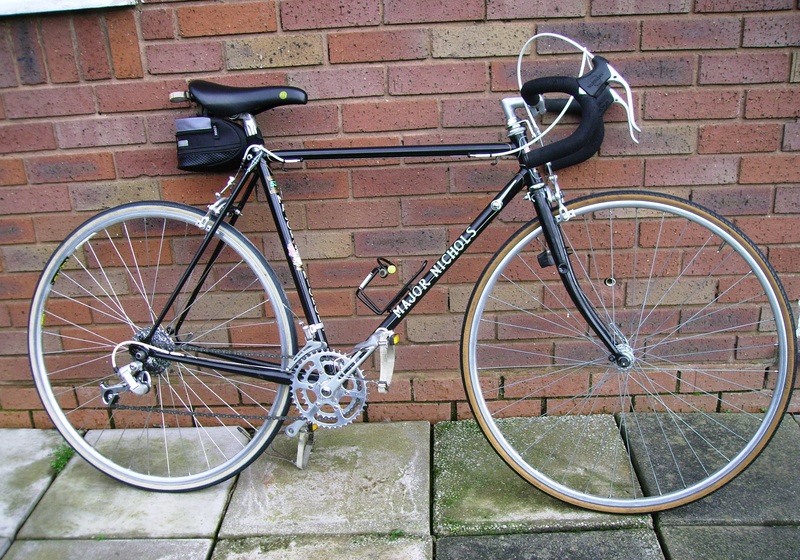 This and the brakes were only available from 1983 at the earliest which raises the issue of year of build yet again for Durban Road bikes. TA Chainset, Iscaselle Saddle on SR seatpost. Weinmann AG CP brake set, SR Road Champion Radonneur bars and 9cm SR Stem, Shimano Deore 7sp, Suntour front and Campagnolo Friction shifters. The steel touring wheels have been set aside for the time being awaiting some more work and redishing the rear which is quite oddly built for a 130mm OLN rear drop out and with a strangely located 5 speed freewheel. Many of the chromed parts especially the steel wheel rims were pretty badly rusted and parts of the paintwork were questionable. 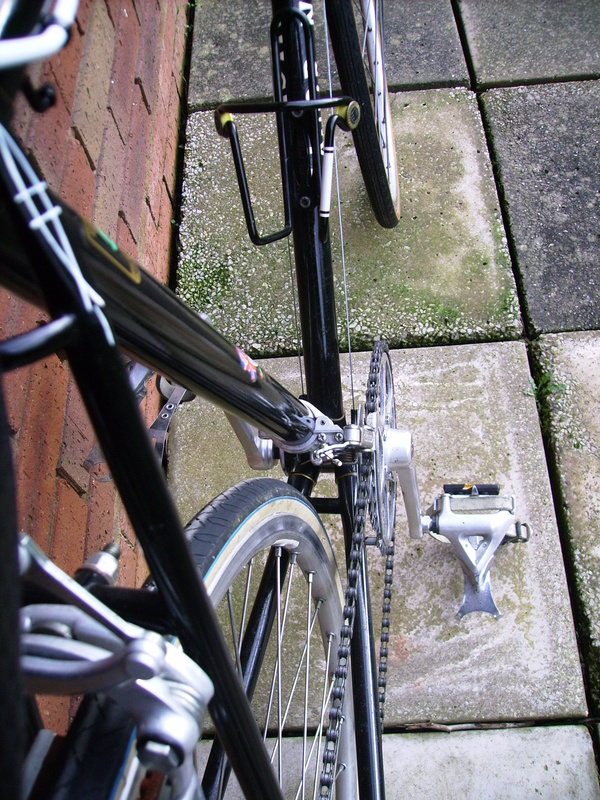 With the exception of the chainset, brakes and mudguards, virtually everything, including the frame needed either serious work or a degree of non- invasive conservation treatment. Fortunately the seat pin and stem were free and they and everything else was removed and boxed to be conserved. The frame was looked at first. It turned out to be a curate’s egg, with good transfers but areas where the beautiful black enamel paint was thin and matt with the beginnings of areas of subcutaneous rust and surface decay. Not as good as I hoped. What to do? I settled for a very gentle wipe with extra fine steel wool in order to remove some of the tiny rust nodules and surface rust and followed up with 5 coats of Renaissance Wax, one of the new polymer waxes used in museums on metal and wood. This should prevent occasional washing after rides from feeding the rust. It disguises the matt areas of thin paint quite well too. 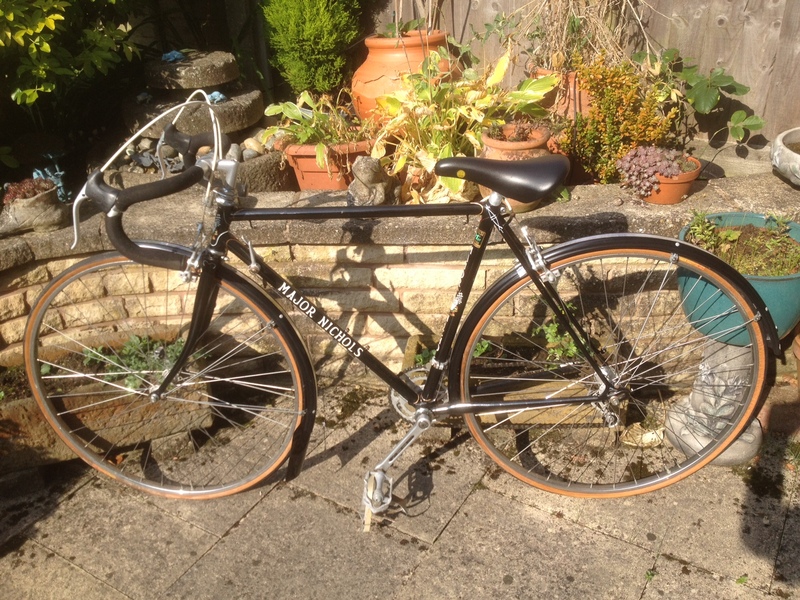 The nice quality Dunlop and Sturmey Archer steel rims on Maillard hubs were a mess. Areas of extensive surface rust and areas beginning to develop crinkle chrome. A few spots of greater concern too. The rims are now quite shiny following a few treatments of lovely green jelly –like Hammerite Rust remover over several days plus extra fine steel wool then Renaissance Wax on the non-braking surface. The damage is still there to see. The tyres are on the edge and have a limited life. I have set them aside for the time being. The rear Maillard hub has been strangely built up with no dishing. It simply uses a big spacer on the N/S to match the drive side! This limits the wheel to a 5sp block and looks very odd. I have fitted a Mavic Pro on Campag Mirage rear as the only 130mm axle spare rear wheel I have and a similar front. The 8sp cassette it is presently supported by a Shimano Deore 7sp long cage derailleur which will do the job until I can afford an 8sp short cage of the era which can get the full range. All the ancillary chromed pieces, derailleurs, track nuts and bolts needed treatment too. The front Suntour derailleur works well but is not at all pretty as the surface was riddled with rust worms. All were de-rusted and waxed to slow rust advance. The Suntour GT rear derailleur is now in fine shape and will be kept for use with the steel wheels and a 7sp block (which I expect Alvin will accept as reasonable!). The usual alloy treatments removed corrosion from stem and pedals, then extra fine steel wool and lastly metal polish and wax. I needed to re-fix lifted leather on the Iscaselle saddle back into place with a contact adhesive. Everything on the bike appears to be time appropriate and useable and the Weinmann AG CP brakes produced only for a year in 1983 look rather good. 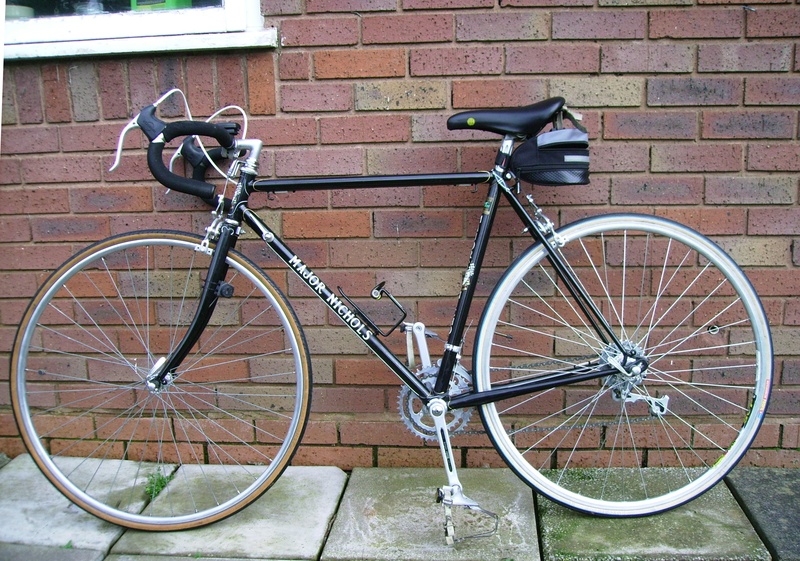 The Reynolds ST tubing is not that light but it still makes a good looking bike which is definitely a clubman’s delight. The original milometer showed 134 miles. I can believe it. I rode her on the trial Lichfield MN ride last year and she looks trim and rides well. Just some toeclips to find to replace the Sturmey Archer Sport ones which would tear up my best leather shoes if I used them on the flaking chrome and rust. The crumbling push-on bar tube covers have to be replaced as they are falling apart now. A lot more work than I expected. I hope to find out more about the original owners, both from Halesowen A & CC, for this record.